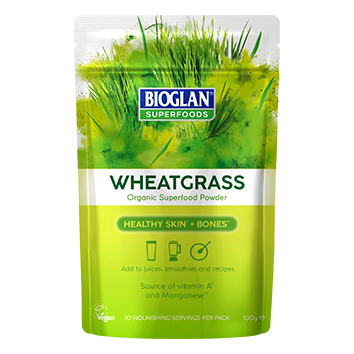 Wheatgrass is the young grass stage of wholegrain wheat, harvested after sprouting, and has been cultivated for over 5,000 years. Wheatgrass is a great source of nutrients including amino acids, chlorophyll, enzymes, vitamins and minerals. There’s no better was to start the day than with a wheatgrass shot, or add it to your juice, water or smoothie. Add 1 teaspoon of wheatgrass to 50ml of water for an energising shot at any time of the day. For a creamy smoothie, add wheatgrass powder, 250ml of almond milk, half a banana and a teaspoon of peanut butter to a blender. Blend and enjoy! Sprinkle some wheatgrass into your bowl of soup or into salad dressings for an added boost at lunchtime.